The blue green waters of the cove wash up at the shores of this 5 kilometre long, narrow, sandy beach. Graceful dunes run along its length, as do lines of coconut trees. The amenities of the beach are fantastic; kiosks sell drink and food; there are vacation homes and hotels nearby if you want to spend the night. The famous Nil Bar is famous for its crab dishes. Kayaking, fishing and stand-up paddling seem to be popular sports. Some outfits offer beach buggy rides. During Carnival times, the beach is extra lively with revelry. How popular is Saco Beach? 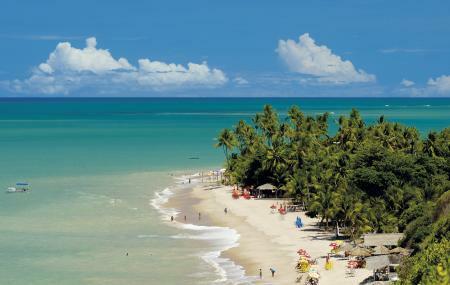 People normally club together Mangue Seco Beach and Aruana Beach while planning their visit to Saco Beach.